Hot coals hurtled past the Wabbit's head. "I draw the line at flying combustion," grimaced the Wabbit and he pulled his radio from his fur. The air was electric and their ears rippled and jumped. Wabsworth checked around with a meter but results came up zero. The walkie-talkie was silent so the Wabbit struck it sharply with a paw. Nothing. The Wabbit switched to short wave. Now he could hear a faint voice. "This is the Department of Wabbit Affairs." There was a chime and a crackle. Then the voice spoke again. "This is the Department of Wabbit Affairs." "This," said Lapinette, "is getting on my nerves." "This," said the Wabbit, "sounds like an automatic transponder." Skratch swiped at burning embers and hissed. "This sounds like an emergency." Wabsworth was an android and he searched though data modules. The Wabbit looked at him. "Anything?" Wabsworth shrugged. "Nothing and a half." "It's nothing on earth then," said Lapinette, "this comes from off-planet." "A third force?" suggested the Wabbit. "Oh I lost count," sighed Skratch. Lightning flashed but the storm was silent, just waves of heat. 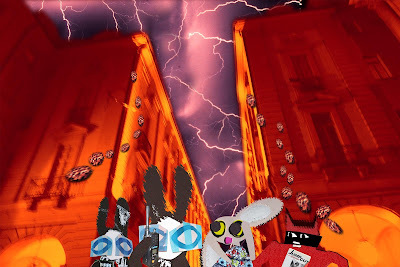 "We need shelter and a thinking space," said the Wabbit. "I know where," said Lapinette. 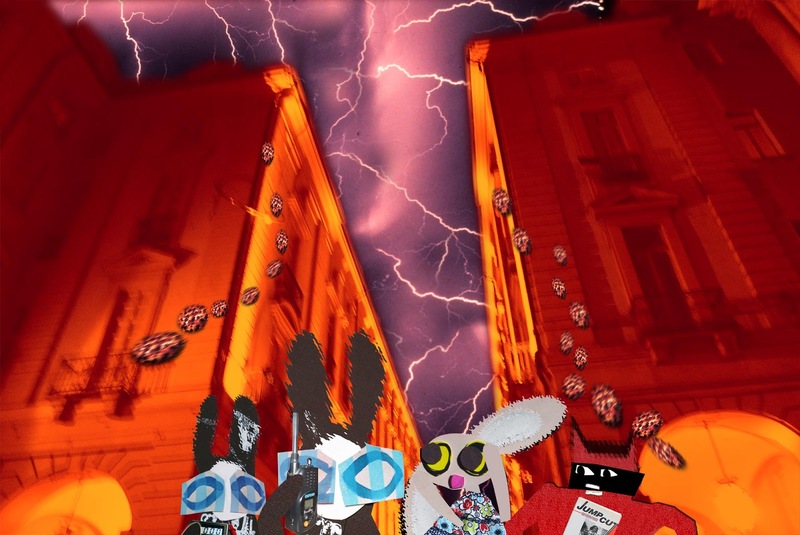 The Wabbit nodded then looked at the city. "No weapons. We don't know what we'll hop into." "We've got blue glasses and attitude," said Wabsworth.